HANOI – A visit by EXPO 2017 commissioner and Kazakh First Deputy Foreign Minister Rapil Zhoshybayev July 28-29 was marked by the Vietnamese government’s announcement to present a national pavilion at the event in Astana. The statement was preceded by Kazakh President Nursultan Nazarbayev’s Aug. 10, 2014 letter to Vietnamese President Troung Tan Sang inviting the Southeast Asian nation to participate. Vietnam is an active member of the International Exhibitions Bureau (BIE) and has gathered solid experience through its involvement in previous expos. The country was represented in the recent exhibitions held in Zaragoza (Spain), Shanghai (China), Yeosu (South Korea) and Milan (Italy). During the trip, Zhoshybaev met with a number of senior Vietnamese government officials, including Deputy Prime Minister Vu Duc Dam, Deputy Minister of Foreign Affairs Bui Thanh Son and Deputy Minister of Culture, Sports and Tourism Huynh Vinh Ai, Vietnamese companies. Discussing the state and prospects of cooperation between the two countries, Vu Duc Dam noted the increasing exchange of visits at different levels has contributed to improving the dynamics of Kazakh-Vietnamese relations in all areas. Talking about EXPO 2017, the Vietnamese official confirmed that his government has made a formal determination on participation in the event. Zhoshybayev welcomed the decision and underlined Vietnam’s presentation at the event would give new impetus to strengthening the partnership between the nations. A meeting at the Vietnamese Ministry of Culture, Sports and Tourism, which is responsible for the country’s involvement in expos, was dedicated to discussing the interaction of relevant state bodies from the two countries regarding the event. Deputy Minister Huynh Vinh Ai told Zhoshybayev of his government’s readiness to sign a formal agreement and appoint a national commissioner who would visit Astana to discuss practical arrangements. In addition, the Astana EXPO 2017 company and Saigontourist, Vietnam’s leading tour operator, signed a cooperation memorandum. The two nations also discussed implementing joint projects in the tourism industry, the prospects of opening a direct flight between their capitals and further promotion of Vietnam’s tourist attractions on the Kazakh market. The rising popularity of Vietnam as a relatively-new travel destination among Kazakhs has been facilitated since 2013 by direct Air Astana flights between Almaty and Ho Chi Minh City. The visit included a review of cooperation in cultural and humanitarian areas. Speaking with Son,Zhoshybayev commended Vietnam’s achievements in executing social and economic reforms and developing a viable market economy. His Vietnamese counterpart noted that as a follow-up to the signing of the agreement on the free trade zone between the Eurasian Economic Union (EAEU) and Vietnam, accomplished at the May 29 EAEU summit in Borovoye, Kazakhstan, Hanoi is considering unilateral introduction of a free-visa regime for Kazakh citizens. In addition to the bilateral meeting, Zhoshybayev took part in a forum on “Doing Business with Kazakhstan” which was attended by more than 70 Vietnamese companies from various industries. Addressing the Vietnamese businesses, Zhoshybayev briefed the audience about key aspects of the Kazakh investment climate and existing opportunities to develop trade and tourist exchange in preparation for and participation in EXPO 2017. 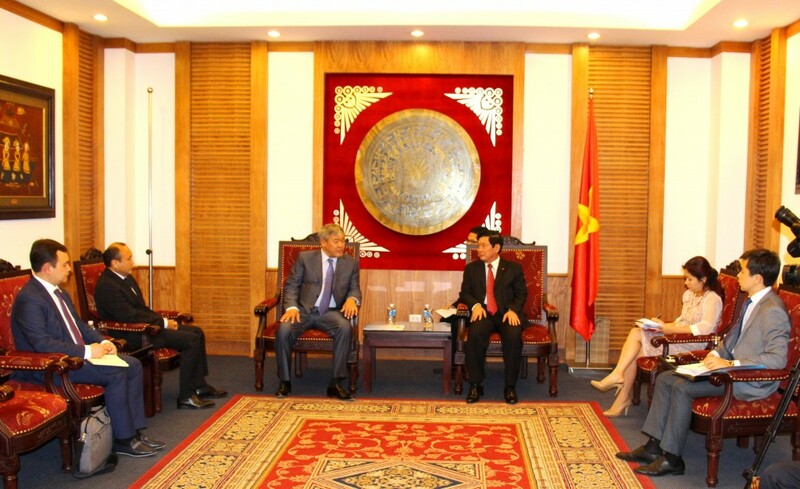 The Vietnamese speakers in turn were particularly interested in discussing new opportunities for bilateral economic cooperation stemming from Kazakhstan’s membership in the EAEU and the free trade zone agreement now aligning it with Vietnam. 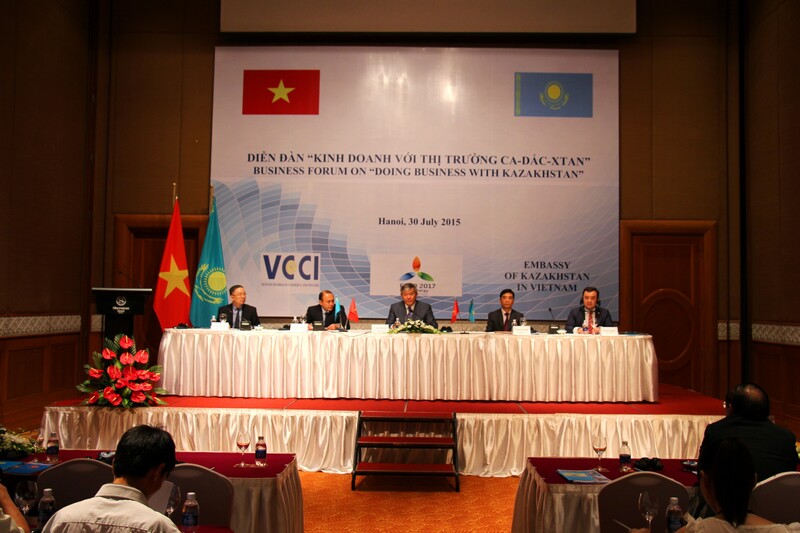 Vice Chairman of the Vietnam Chamber of Commerce and Industry (VCCI) Doan Duy Khuong highlighted the fact that in recent years, Kazakhstan and Vietnam have signed a number of framework agreements on economic, trade, diplomatic, education, investment, labour and energy co-operation in recent years, according to a report in Vietnam News, a national English language newspaper. Speaking about the EAEU agreement, Doan DuyKhuong said that in conjunction with it Vietnam would enjoy export tariff incentives for farm produce, seafood, garments, footwear and wooden furniture, as well as open markets for farm produce, machinery, equipment and transport vehicles. Other commitments cover services, investment, intellectual property, competition, trade protection and dispute settlement in line with World Trade Organisation regulations, he added. The Kazakh Foreign Ministry press release reported that the country’s trade turnover with Vietnam in 2014 totalled $271.9 million, while the first four months of 2015 have reached $73.7 million. According to Vietnam News, Vietnamese exports consisted primarily of cell phones and electronic spare parts, machinery and farm produce, while imports from Kazakhstan include ore and minerals. Vietnam became the 34th country to date to confirm its participation in EXPO 2017. 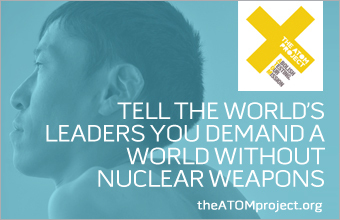 Others include Angola, Armenia, Azerbaijan, Belarus, China, Croatia, Cuba, France, Gambia, Georgia, Germany, Grenada, Honduras, India, Israel, Japan, Kyrgyzstan, Liberia, Malaysia, Marshall Islands, Monaco, Nauru, Pakistan, Romania, Russia, Saint Vincent and the Grenadines, Saint Kitts and Nevis, Senegal, Switzerland, Tajikistan, Turkey, Turkmenistan, and Vanuatu.